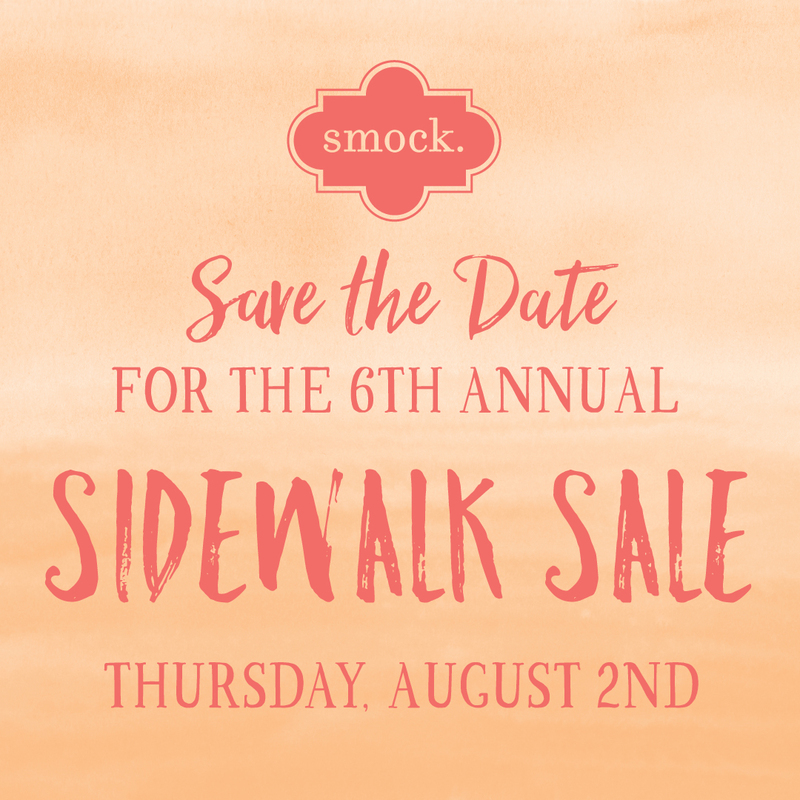 Mark your calendars for Thursday, August 2nd from 10:00 AM – 7:00 PM for our 6th annual Smock Sidewalk Sale. 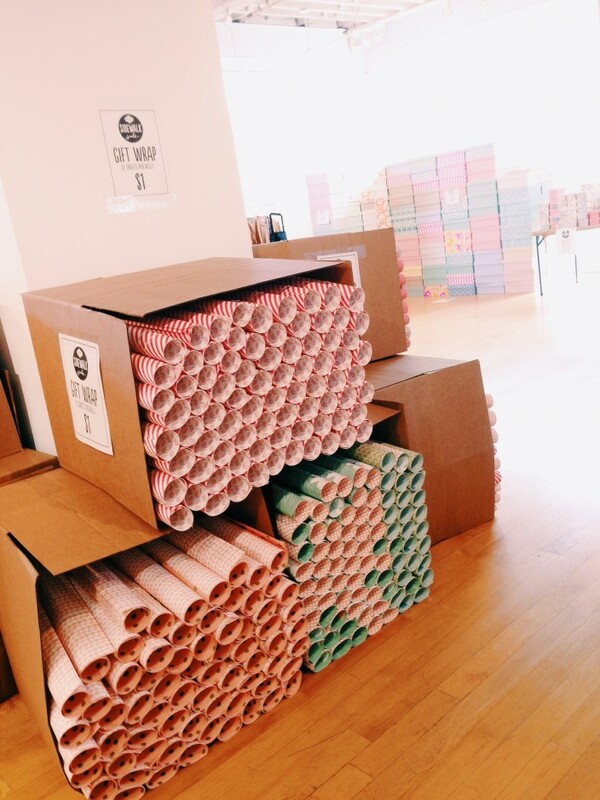 Complete with deeply discounted letterpress cards, gift wrap, stationery goods, and more! 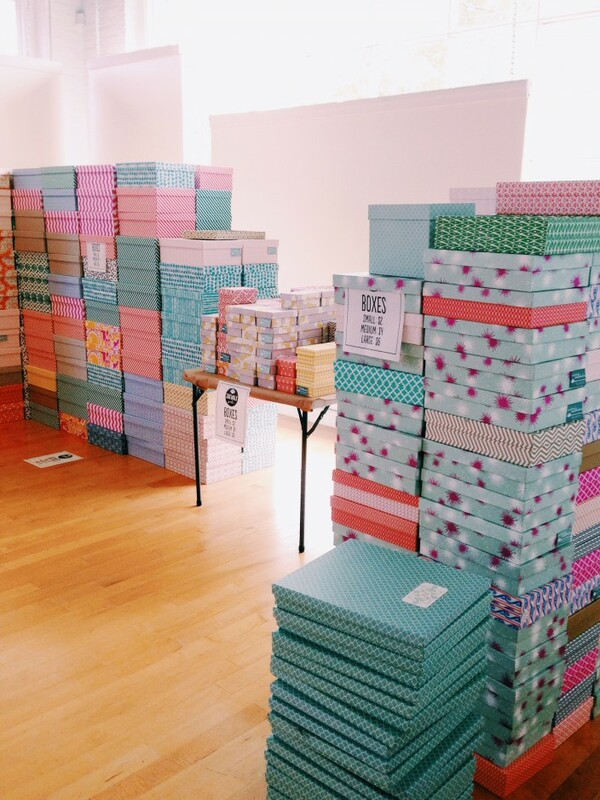 Oh, did we mention we will be selling our LIMITED EDITION KEEPSAKE BOXES?! Don’t forget to bring a reusable bag to save 10% off! Invite a friend and get your holiday shopping done early. 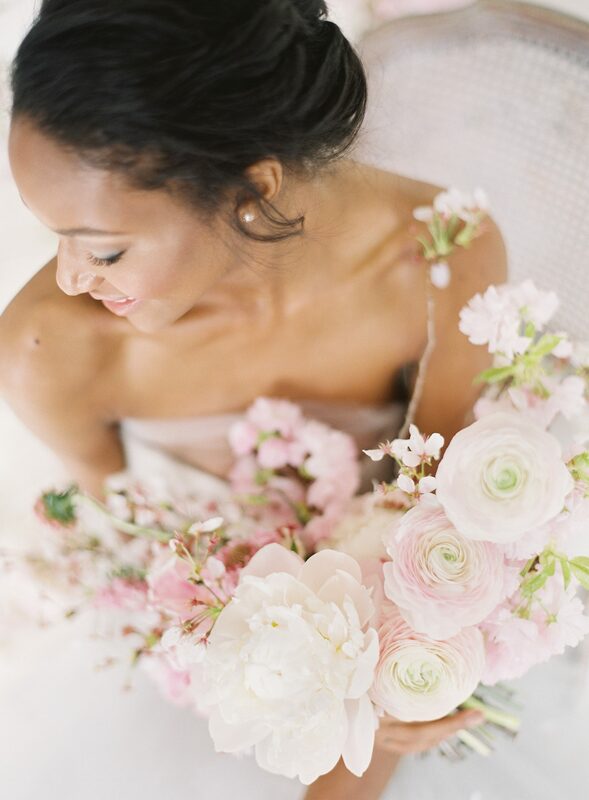 This event will be held at the Delavan Center, located at 509 W. Fayette St., Syracuse, New York 13204. Several area food trucks including PB & J’s Lunch Box, Toss N’ Fire Wood-Fired Pizza, and Gannon’s Ice Cream will be on-site for our guests to enjoy. We’ll also be offering a prize wheel, for $1 guests can spin the wheel for a chance to win FREE products or gift cards from Smock. All proceeds will benefit Onondaga Earth Corps, a local organization dedicated to empowering area youth through urban forestry projects. 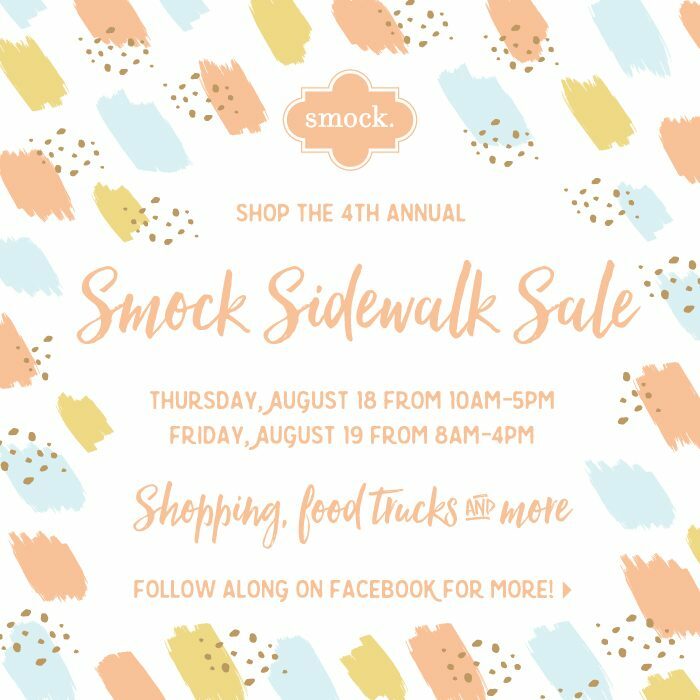 Be sure to check out the Smock Sidewalk sale event on Facebook for updates! For $1, guests can spin a prize wheel for a chance to win free products or gift cards from Smock. All proceeds benefit Onondaga Earth Corps, a local organization dedicated to empowering area youth through urban forestry projects. 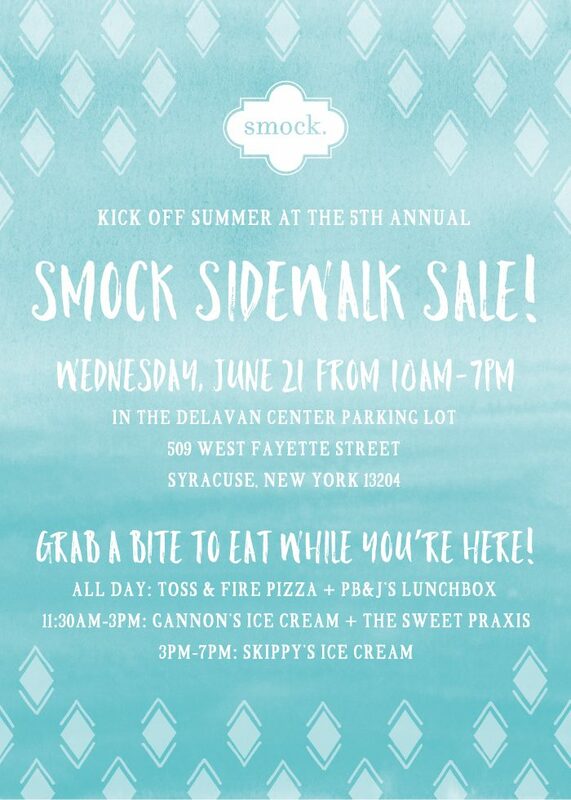 Kick off Summer at the 5th Annual Smock Sidewalk Sale! 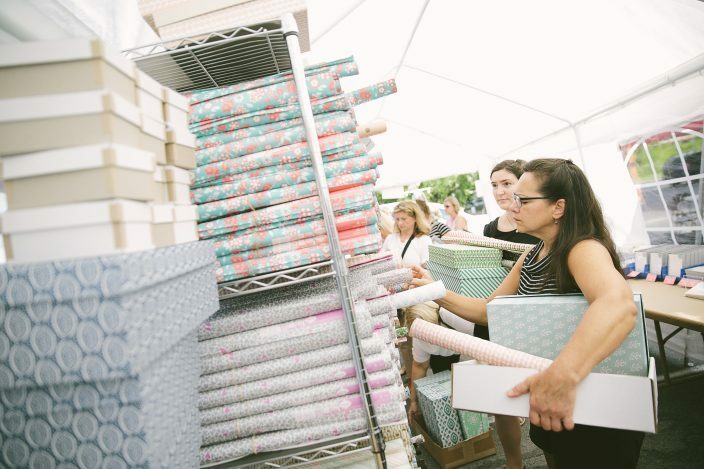 Help us welcome summer at the 5th Annual Smock Sidewalk Sale on Wednesday, June 21 from 10am – 7pm. We’ve made some changes to the sale this year (like extending the hours!) to accommodate our loyal shoppers throughout the day. 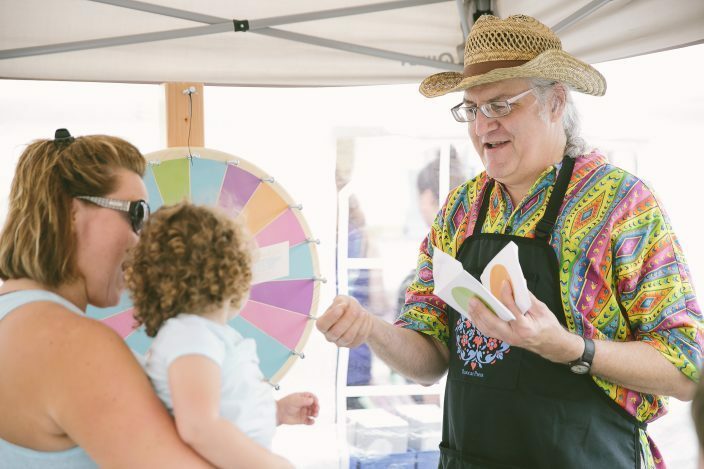 In addition to our deeply discounted cards, gift wraps, and other stationery delights, we’ve brought back some of our favorite local food trucks for the sale this year, too! PB&J’s Lunchbox and Toss & Fire Pizza will be here all day long, so whether you’re stopping by on your lunch hour or after work on your way home, you’ll be able to grab a bite of some delicious local foods. New for this year, we’re excited to welcome our friends at The Sweet Praxis, and to help you keep your cool, Gannon’s Ice Cream and Skippy’s Ice Cream will be joining us throughout the day too! We’re also pleased to be bringing back a carnival-style fundraiser to benefit our friends at Onondaga Earth Corps — for a $1 donation, you can spin a colorful prize wheel for a chance to win prizes from Smock, as well as some of our participating vendors! Say you’ll be there and stay tuned for event updates on Facebook! We’re having another Sidewalk Sale! 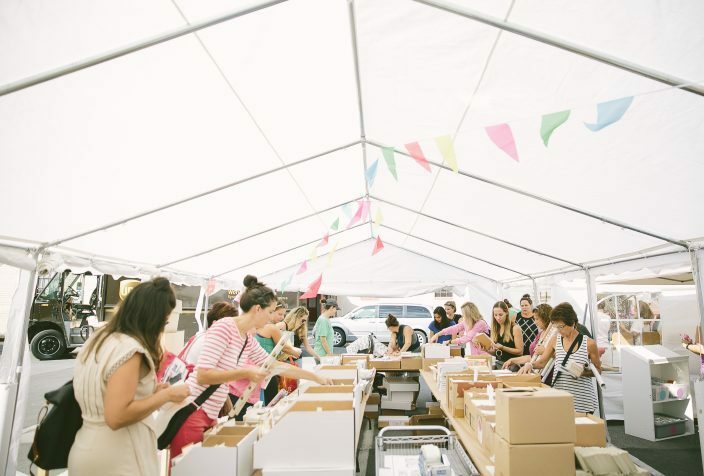 Join us on August 20 + 21 to stock up on stationery essentials and grab lunch from some fantastic local food trucks! We’ll have a wide variety of letterpress cards, gift wrap, keepsake boxes, coasters, calendars and more to choose from. Check out the photos below from last year’s event to get an idea of what we’ll have available! Many thanks to the following local food trucks who are confirmed for the event: PB&J’s Lunchbox | Toss ‘n’ Fire Pizza | Carvel Ice Cream | Gannon’s Ice Cream. Be sure to check out the event on Facebook for updates! Shop Our 2014 Sidewalk Sale on August 13-14 from 11am-5:30pm! 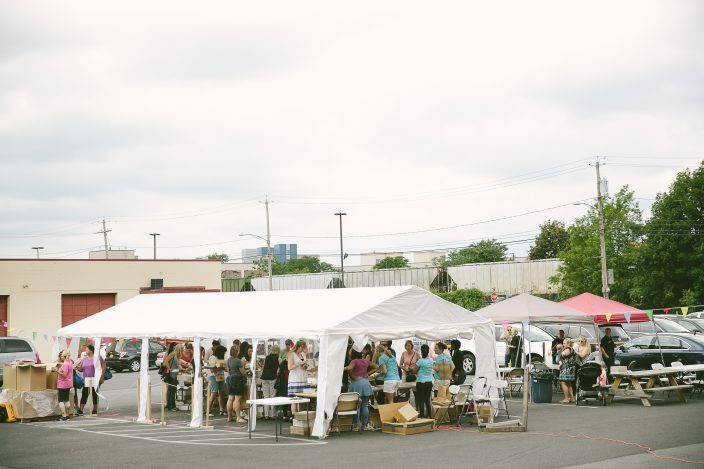 Last year we held our first ever Sidewalk Sale, and the event was a huge success! 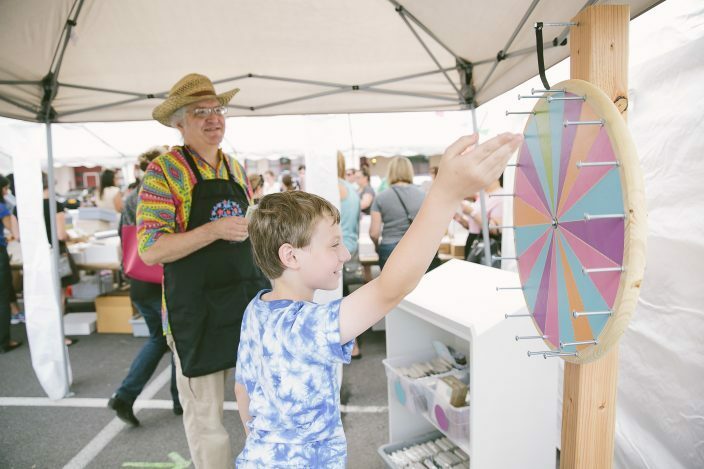 This year, we’re planning another Sidewalk Sale with even more product offerings, more food trucks, ice cream from Gannon’s Ice Cream, letterpress printing demonstrations, and even a paper airplane golf course! 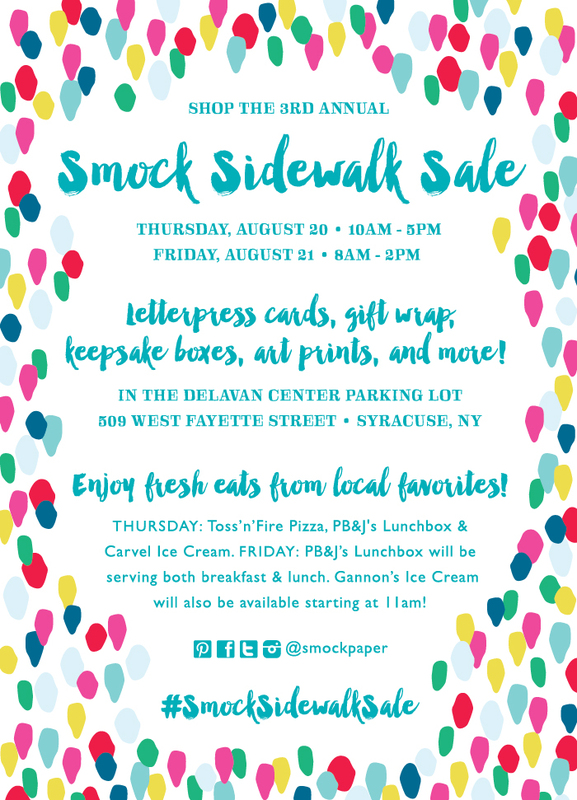 Event attendees can enter to win a $100 Smock gift card, and we’ll be donating $5 to Onondaga Earth Corps for every person who completes our paper airplane course. Be sure to RSVP to the Sidewalk Sale on Facebook! 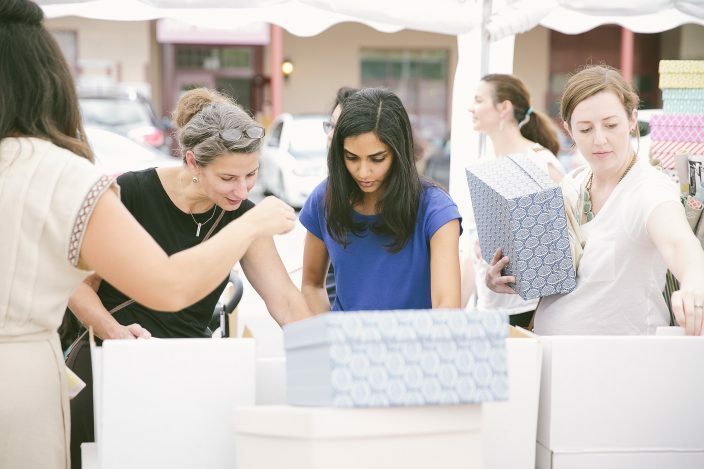 Many thanks to the following local vendors for partnering with us for the 2014 Sidewalk Sale: Street Eats, Ladybug Lunchbox, Smoke Inc., PB&J’s Lunchbox, Recess Coffee, Cafe Kubal, and Gannon’s Ice Cream! 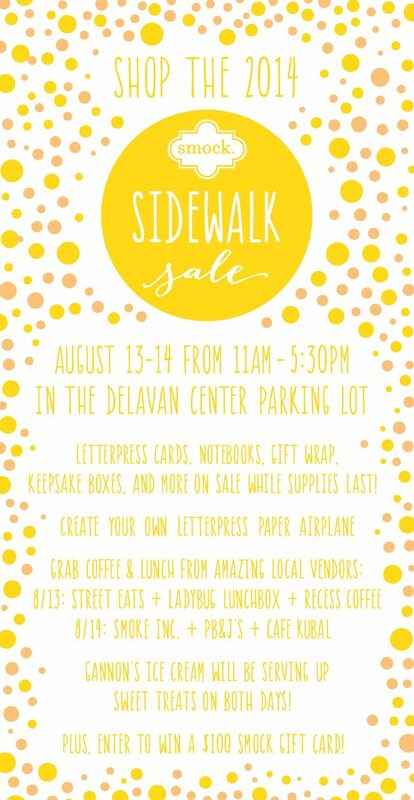 *In the event of rain, the Sidewalk Sale will be moved inside to the Delavan Center Art Gallery – enter at the 501 entrance!